Millions of referendum-weary Britons are planning to get away from it all by heading off on holiday over the next few months, a new report suggests. 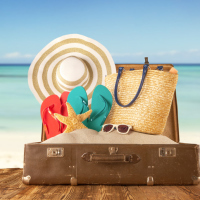 Despite the uncertainties surrounding the outcome of tomorrow's historic vote on the UK's membership of the European Union, the research indicates that people are more optimistic about their holiday plans than they were this time last year. According to the survey, nearly three quarters (71%) of us anticipate taking at least one holiday between now and the end of the year whatever the outcome of the poll. That means millions will still be holidaying at resorts in EU countries such as France, Spain, Greece and Portugal whether the UK has decided to leave or remain within the European Union. Many more will be heading even further afield to destinations such as Florida, Thailand, Mexico and Brazil, which is hosting the Olympic Games in August. Travellers are advised to make sure they go armed with plenty of foreign currency and a worldwide travel insurance policy. While millions of people are set to travel to Europe and beyond, even more are expecting to have a holiday in the UK. The latest Greene King Leisure Spend Tracker suggests 85% of Britons plan to take at least one domestic holiday during the remainder of 2016. That proportion is 3% higher than it was this time last year, Greene King says. Rob Rees, group marketing director for Greene King, says the research suggests that many people are looking forward to putting the referendum behind them by taking some "well-earned holidays". But while optimism about holidays seems to be growing, the average UK household spent £207 on leisure activities outside the home in May, 3% less than during the corresponding month of 2015, according to the report. Greene King puts the overall fall - after households with children spent less on leisure in May while those without splashed out more - down to the fact that the school half-term break fell in June.